When I showed you how to make a real ivy topiary, there were a few people who asked to see the topiaries lit at night. I aim to please so here I am. 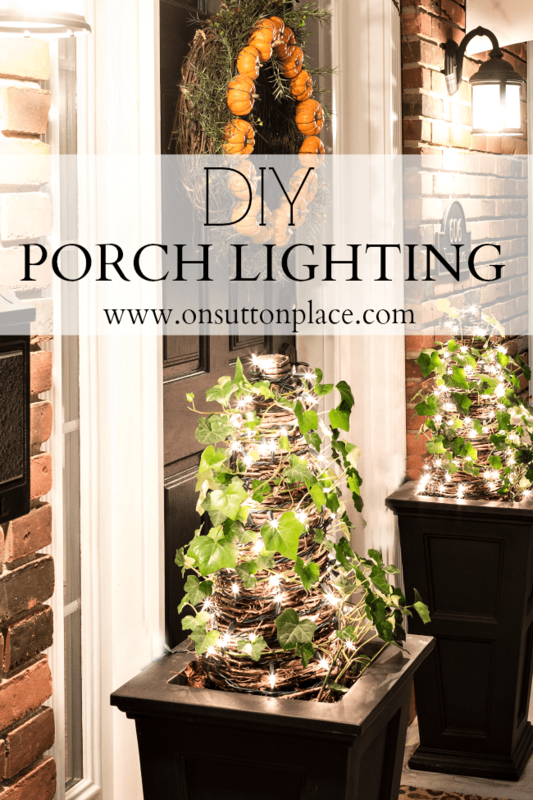 I’m also sharing a few DIY porch lighting ideas. This is DIY at its best too…all you need are a few extension cords! Even though we haven’t turned the clocks back yet, it’s getting dark very early. It was definitely time to hook up the lights on the topiaries. It’s really very simple. I use two extension cords. In the picture below I show you how I ran the first one. I plugged it into the light cord on the LEFT planter. It runs down behind the planter, sort of under the door mat, and up behind the planter on the RIGHT. It’s plugged into extension cord #2. 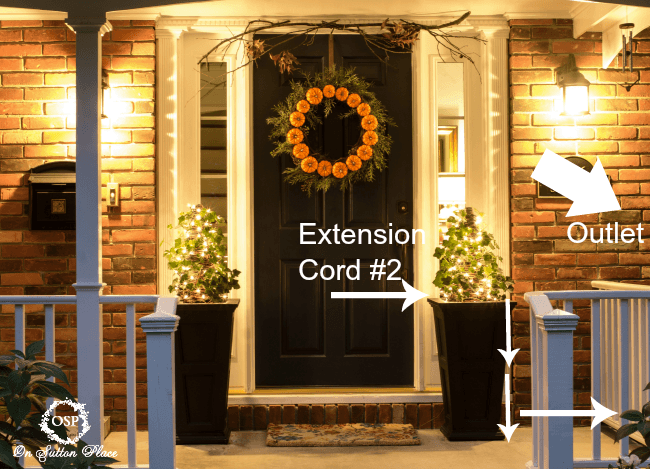 Extension cord #1 and the lights on the RIGHT topiary plug into extension cord #2. It runs down the back of the planter along the edge of the porch and over to the outlet. I have the topiaries hooked up to a remote control so I can turn them on and off from inside the house. Definitely a must in the cold weather. The ivy on the topiaries has filled in better than ever before. The pic below is how they looked back in August when I planted the ivy. I have been faithfully watering them and it has definitely paid off. In addition to the porch lights and topiaries, I always have a lamp in the sitting area of the porch. I don’t always turn it on…but it’s nice to be able to add a little charm when I want to. There is no outlet over there either so I have to run an extension cord from the porch into our garage. I don’t have any probllems with the garage door operating correctly even though it sits on the cord. 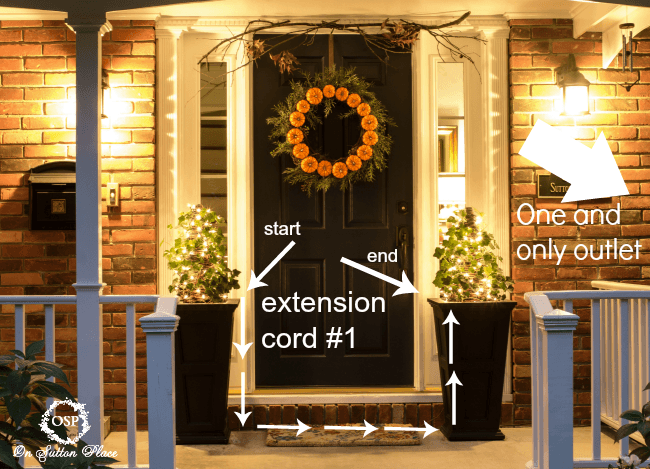 I use a heavier, outside extension cord for this. 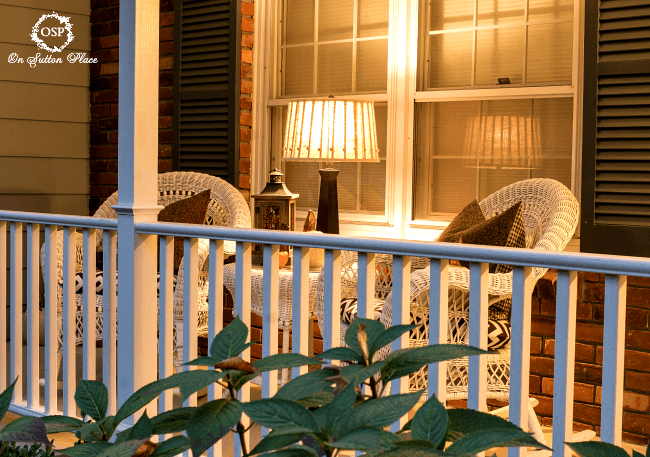 If you live in an older home you most likely don’t have any outside lighting other than porch lights. I love the way newer homes are lit all over. I can’t get that look, but I can highlight my porch and easily brighten things up. Anyone can do this…you don’t need topiaries in planters. Put small boxwood in pots and add lights. 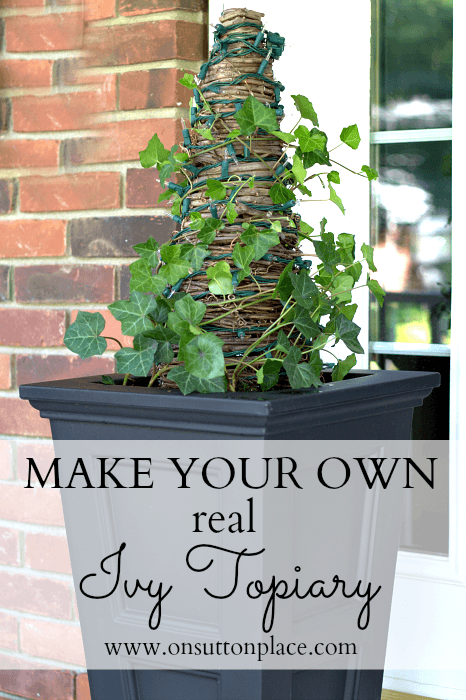 Use just the grapevine topiary without ivy or use any type of faux greenery. I’ve had years of practice trying to get the look I want while working within my limitations. Don’t let your limitations hold you back! I’ll be here over the weekend with more on my latest wreath update. I really wanted to try a circle of pumpkins and it actually worked! See you then…as always thank you for stopping by. I love it when you visit. I love the cozy seating corner! It’s almost like a little outdoor living room. I live in an older home and have been struggling to make my front porch looking welcoming on a budget. 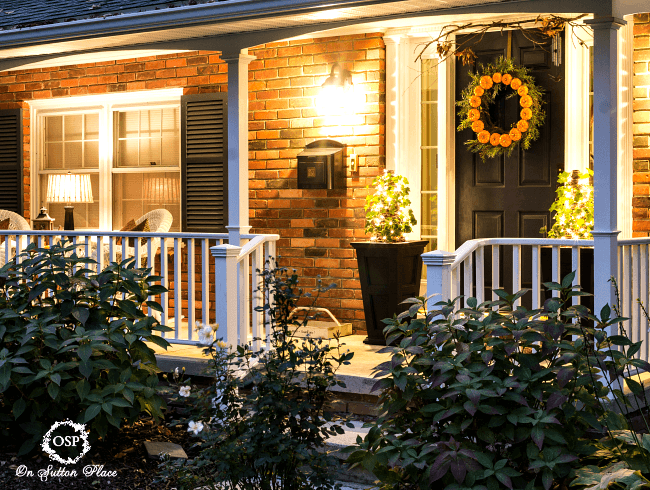 I too only have a porch light and one socket – this year I added a couple of small boxwoods, so I am definitely going to add some lights to the mix! Love love love the topiaries Ann! I would love to do this! Thanks! 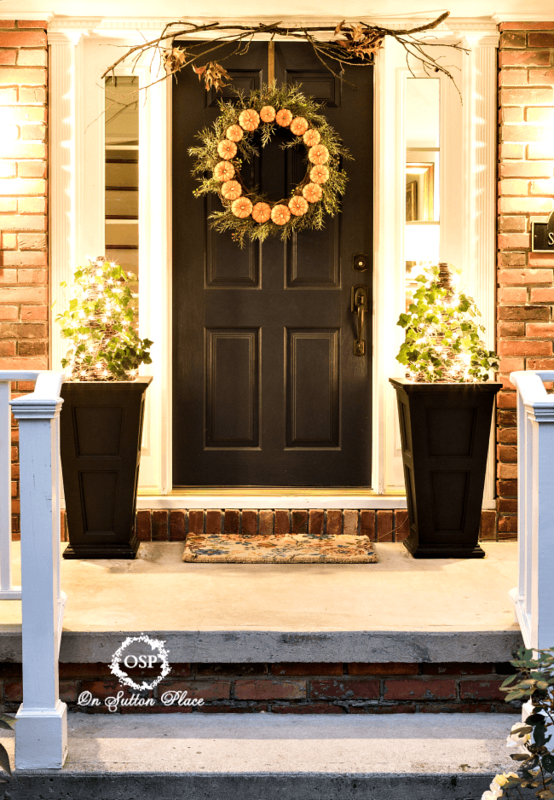 Ann your front porch looks so pretty…love your wreath! Your porch is just so lovely!! I wish it were my porch. I love your lighting idea, thank you for it. I think I will put my tomato cage lighted tree on my porch today. It’s not too early for some extra ambiance. I love your porch, I want a porch like yours on our next house. Love your topiaries, Ann. Really…you are a wonderfully talented person. Thanks so much Ann! I love how your extension cords don’t even show! What a great little tutorial! Your front porch is really welcoming and lovely. I would like to add a lamp to my outdoor door decor, but it’s so so windy here that it would be in the field across the street in no time. Pinning! That pumpkin wreath is adorable and I love the welcome of the lit topiaries. 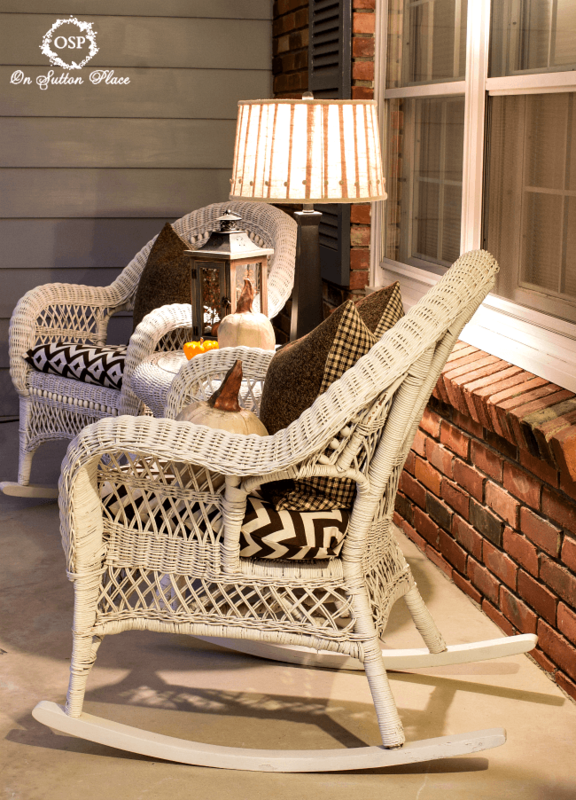 Your porch looks very cozy and inviting with the two chairs. Just need a cup of coffee and a friend for a chat , thanks for sharing. Your topiaries are just adorable, and the whole porch looks lovely! Ann, I noticed your new wreath immediately! 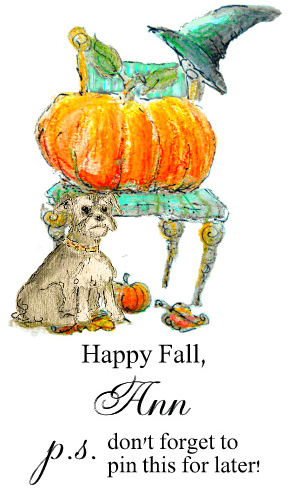 Can’t wait to hear how you got those pumpkins to stay on it! Those lighted topiaries are so beautiful at your front door and I am getting all kinds of ideas from you especially about using a remote to turn them on and off! I love the pumpkin wreath! Can’t wait for you to tell us how you managed to get the pumpkins to stay on the wreath. Are they wired together? or some special kind of glue? My post is going up tomorrow with the details. Definitely no glue! :( maybe after our vaca next week I can get him going on some of my projects! I love the lamp idea on your porch – I’m afraid our cats would knock one off if I did that though – will have to find a really heavy one. Love the idea of hanging a ladder from your porch ceiling! I’m into ladders right now anyway and that sounds perfect. In all the years I have had a lamp on my porch it has never fallen over. Not even during the terrible storm in summer of 2012 when we had the power outage. I don’t have cats though…lol! How pretty Ann. I know if I were walking by I would want to come knock on your door and say hey, can I sit here for a while it is so cozy! Great idea with the lighting, so ambient too. I like your topiaries all lit up at night. They make the front entry feel so welcoming to guests. I have a milk can by the front door with branches and hydrangea at the moment. In fall I use little lights that look like candy corn so they’re orange and make a cozy glow at the door. They are plugged into extension cords that run along the edge of the deck to an outdoor outlet. This outlet is connected to a timer in the garage that is set for them to come on and off at pre-set times. I plug my Christmas lights in to that as well. Makes it easy and automatic! It turned out beautiful, I am loving it all lit up. Great project that can be used any time of year. You are talented! Your topiaries and porch are so pretty, what a lovely welcome to all your guests! Now that is too cool! AND it brightens up your porch light nicely!